The Brown Family: Clothes, Shoes, Supplies...OH MY!! 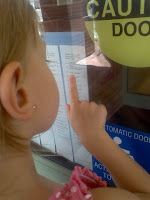 We were too excited to wait for the teacher's postcard to find out who she is, so we went to the school to check it out...they have the lists posted on the front door of her school. 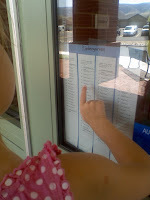 Her kindergarten teacher is...drumroll, please :)...Mrs. Edna Geise! I still get a kick out of the fact that she has yet to see her show! All packed up and ready for her FIRST DAY!! 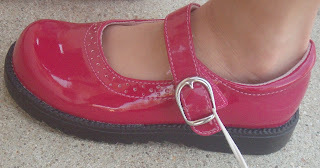 She just fell in love with these pink patent leather mary janes! 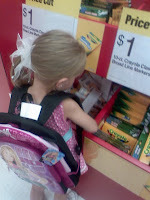 So we got them for her among many other things! 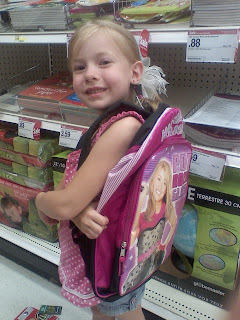 School shopping is so much FUN!! You sure did get into this Blogging thing. It looks great. 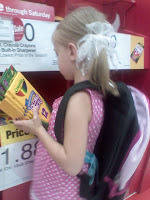 What cute kids, I love the bookbag and school supplies! I'm going to be so sad to See Cloe go in two years. Shhhh!! All is Quiet on the Home Front! Mikenna + Doodle Pro = CUTE! !